SOCHI, Russia - Hilary Knight (Sun Valley, Idaho), Kelli Stack (Brooklyn Heights, Ohio) and Alex Carpenter (North Reading, Mass.) 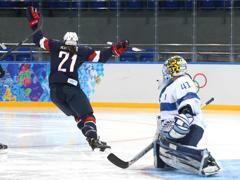 each scored and goaltender Jessie Vetter (Cottage Grove, Wis.) turned away 14 shots to help the 2014 U.S. Olympic Women's Ice Hockey Team beat Finland, 3-1, in the team's opening game of the Olympic Winter Games at Shayba Arena. "I'm happy with the way our team started the game today," said Katey Stone, head coach of the 2014 U.S. Olympic Women's Ice Hockey Team. "Obviously, to have an opportunity to score in the first minute of the game takes a little bit of the edge off the anxiety of the first game. I liked our team speed, we moved the puck really well and we scored three hard-earned goals. We're happy to have the first game under our belt and we're looking forward to Monday." Knight opened the scoring just 53 seconds into the contest when she converted on a semi-breakaway. After good pressure by Amanda Kessel (Madison, Wis.) created a turnover in the neutral zone, Knight scooped up the loose puck at the offensive blue line, flew into the zone and beat Finland goaltender Noora Raty with a quick wrister to the blocker side. Team USA doubled its lead 7:42 into the middle frame when Stack scored from the edge of the crease. Off an offensive-zone draw, Megan Bozek (Buffalo Grove, Ill.) used the end wall to get the puck to the front of the net, where it bounced off Knight and right to Stack. Stack waited for the puck to fall below the height of the crossbar and batted it out of the air past Raty. Just over eight minutes later, Carpenter connected on a power play to boost Team USA's edge to 3-0. Knight used her body on a Finnish defender behind the net to force the puck loose, and the Americans worked it across the zone to Anne Schleper (St. Cloud, Minn.) at the far point. Schleper's wide shot ended up on the stick of Carpenter, who backhanded the puck in from the bottom of the right circle. Finland scored a power-play goal of its own at 15:22 of the final stanza to spoil Vetter's shutout bid, but the United States didn't allow the Finns to pull any closer. 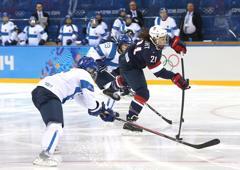 The U.S. Olympic Women's Ice Hockey Team is off tomorrow (Feb. 9) before resuming action in the 2014 Olympic Winter Games Monday (Feb. 10) against Switzerland. Puck-drop is scheduled for 5 a.m. ET. 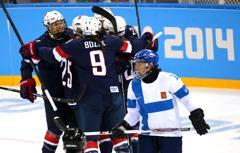 NOTES: The U.S. Olympic Women's Ice Hockey Team has medaled in all four Olympic appearances to date (gold-1998, silver-2002 and 2010, bronze-2006) ... 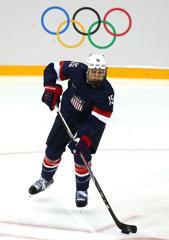 The 2014 U.S. Olympic Women's Ice Hockey Team is under the direction of General Manager Reagan Carey (Colorado Springs, Colo.) ... Katey Stone (Arlington, Mass.) was named head coach on June 8, 2012, and is the first female to serve as head coach of a U.S. Olympic Women's Ice Hockey Team ... USA Hockey's international council, chaired by Gavin Regan, vice president of USA Hockey, has oversight responsibilities for all U.S. Olympic Teams.